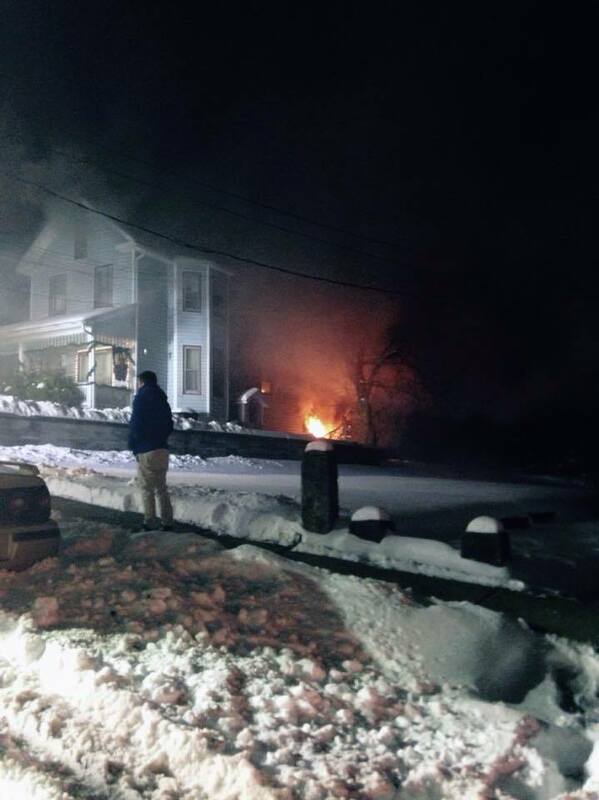 Around 2:45 this frigid morning, BFD was again dispatched for a dwelling fire. This time the location was Reynolds Avenue in the Borough. BPD arrived and confirmed a "working fire". Chief 56 arrived establishing IC, reporting a probable basement fire. The structure was a large 2 story dwelling, converted into apartments. Quint 227 (4 men) arrived and laid a supply line from the middle of the block into the scene, and stretched an attack line to Side D. Fire was showing ...from the basement, and extending up the exterior wall. 227's crew descended into the basement, and encountered difficulty locating the seat of the fire. The crew maneuvered their hoseline into the first floor and encountered fire extending through the walls in multiple areas. Engine 210 (6 men) arrived, picked up 227's supply line and charged it. Their crew came forward and deployed additional lines off the Quint, and laddered the building. Once again, multiple crews from BFD and Mutual Aid companies were required to extensively open up the interior voids, and exterior walls to chase down pockets of fire. Quint 227 pumped 4 lines during the fire. THANK YOU, to all Mutual Aid (Pleasant Gap, Milesburg, Alpha, Centre Hall) companies for your assistance. Thank you to the folks who have been donating food, making coffee, etc over these last 9 busy days. It is much appreciated ! !